The Bombardier Q400 Propeller is an all composite blade propeller built by Dowty Propellers a GE Aviation company. The Bombardier Q400 Propeller is designated as the Dowty R408 propeller. 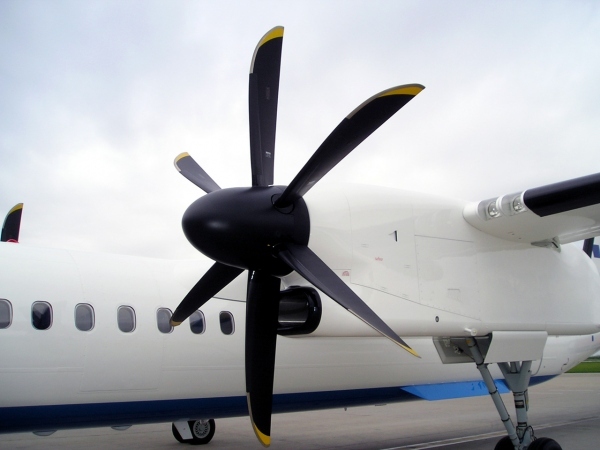 The Bombardier Q400 Propeller has 6 blades with an advanced swept blade design. Overall the Dowty R408 Propeller helps the Q400 achieve the performance and low noise levels it is famous for. Above Bombardier Q400 Propeller Dowty R408 Photo from Dtom on Wikimedia Commons. Officially the Dowty R408 propeller's name is the Dowty (c)R408/6-123-F/17. It was originally certified by the British Civil Aviation Authority (UKCAA) and then validated by the Federal Aviation Administration (FAA) to achieve United States certification. On September 28th, 2003 the European Safety Agency (EASA) took over oversight of the product.